ASMT Summer Cheer Camp is designed for students of all levels. Students will train on tumbling, stunting, jumps, motions, & dance. Each day at camp, students will participate in arts and crafts, team building activities, and goals setting. On the last day of camp students will perform a spirit routine for their family. training to make their school cheer teams in Las Vegas and surrounding cities. We encourage all students that are interested in cheerleading to sign up for a complimentary cheer consultation. Students will receive a free skills evaluation, learn about our programs, & receive a personalized cheer training plan. ASMT Academy offers private instruction for all ages & skill levels (5yrs to Adult). We have experienced coaches that are trained to instruct the following: tumbling, stunting, flexibility, jumps, dance, cheers, and fitness. ASMT membership is not required to participate in private lessons. Please contact our office to book a private lesson! Private Instructor work on a RSVP basis, so call office and book your private today. 702-778-2939. In addition to private lessons, we offer a variety of rec classes. 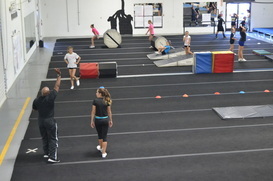 Tumbling classes range from entry level skills all the way up to elite tumbling. In addition to tumbling classes, we also offer fitness classes, which are open to all ages! ASMT membership is required for monthly enrollment, but anyone can drop into a class. Classes have a limited number of students. Be sure to call ahead for drop-ins and make ups.